If apple was the name of a color just like orange, what color do you think it would be? Imagine if we were all asked to create our own colors without having known what colors looked like already, what would your color look like? What would you name it and Why? Imagine if i wore a dress that was color apple, how fascinating would that sound in a sentence. I guess it will make more sense saying it this way, "The Red Delicious Apple capri pants by Ralph Lauren....., The Golden Delicious Apple maxi skirt by Miu Miu, The Granny Apple dress by Saint Laurent...., The Fuji Apple horsebit loafers by Gucci...., Gala apple suede bag by Celine....," blah, blah.... and that is how the color apple start to stick with you. Soon it will become accepted. You heard it here first ;). My point exactly? I love colors but i don't have a favorite. If it is bright and it makes me smile i would wear it. Bright?!! Eek!! You scream?! Ha ha ha it depends sometimes.... I am not going to wear neon(not that kind of bright) from head to toe but then again it sounds worth trying. 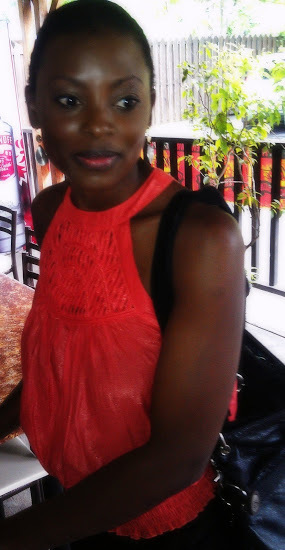 The orange top by Vertigo was one of my spring cleaned item which i wore a couple of weeks ago in Jamaica. It seemed like a good day to have some jerk chicken so we took a trip to town to The Jerk Center inn Ocho Rios. Soon after i stopped to take this photo on my way back home, the rain came pouring down and the rest is history. The shorts, the bag and sprinting came in handy. Memories. Create a color that never existed, name it. What would it be and why?